Circulation of CSF, ISF, and brain solute through the glymphatic pathway. 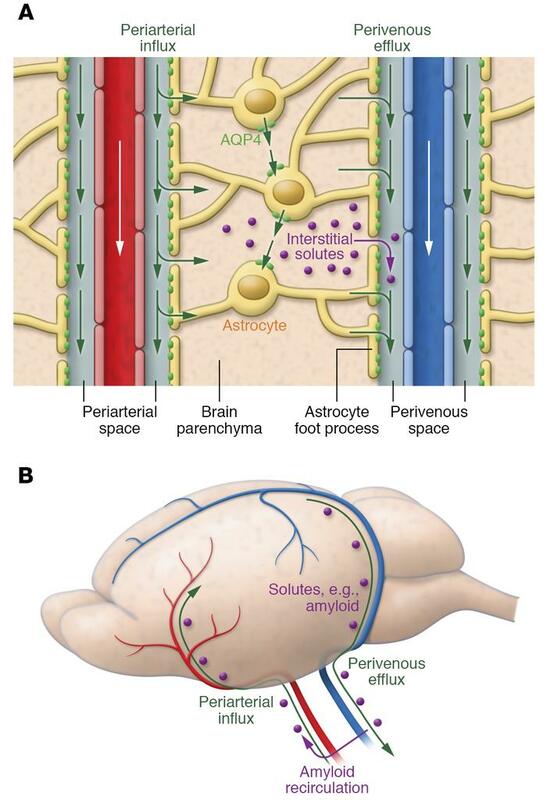 (A) CSF within the subarachnoid and cisternal spaces flows into brain specifically via periarterial spaces and then exchanges with ISF facilitated by aquaporin-4 (AQP4) water channels that are positioned within perivascular astrocyte end-foot processes. The bulk movement of CSF into brain drives the convective flow of ISF and interstitial solute through the extracellular space to ultimately collect within perivenous spaces. (B) Perivenous fluid and solute then drain from brain predominantly alongside large-caliber ventral veins. Once within the subarachnoid CSF, solutes such as amyloid-β can exit the cranium via arachnoid granulations or meningeal lymphatic vessels or along cranial and spinal nerves; however, a proportion is also capable of recirculating into brain via periarterial spaces. Periarterial solute may seed and accumulate within the basement membranes of smooth muscle cells, precipitating conditions such as cerebral amyloid angiopathy.